I love it! Not too small , not too big! Perfect size! And it’s amazing. I already have to hide it in my room. It’s a perfect lil vacuum and very powerful . Everyone in the house wants to borrow it, and don’t want to return it back to me. We use it for the ours rooms and they put a long extension cord attached to it for the vechices too! I don’t have a problem with sharing , it’s with returning my items back to me. And this is one of my favorite items I bought fit my self to vacuum little areas like my rugs, sofa, inside of My vechicle. But they won’t return it back . I recommend this handheld dirt devil to everyone! Great buy, light weight, fast suctioning, and pick up. I also use it for sucking air out of my giant storage bags for storing my items. Great Buy!!! The ultimate in power and convenience. The motorized brushroll is ideal for lifting pet hair and dirt from upholstery, stairs and car interiors. The crevice tool and hose are built in allowing you to rapidly switch cleaning modes. Clean the tightest spaces and switch back to the brush for floors and furniture. 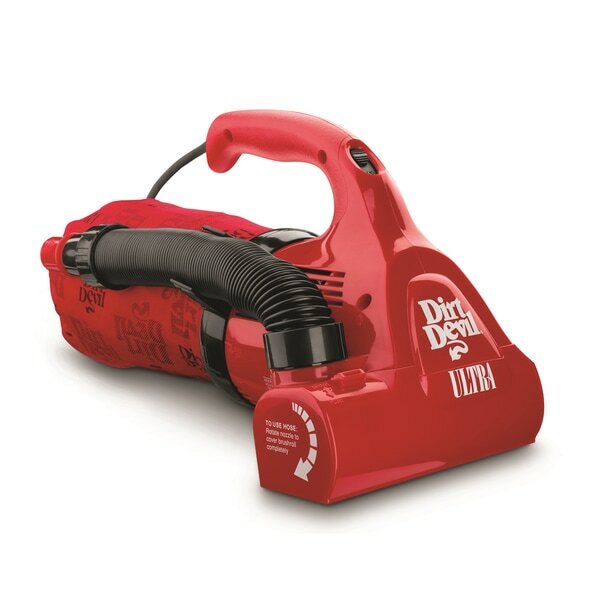 This is my third Dirt Devil in the past 30+ years or so, I've even recommended it for friends (especially for vacuuming stairs). Even though I have mostly all tile floors, this little vacuum is used in small areas for a quick cleanup or for the furniture. Much better than lugging around the big floor vacuum. I would give it five stars of it didn't spit things out the back. It works for easily cleaning the stairs and I like the hose option. This is such a handy size hand vac. I use it all of the time for hard to reach areas and quick clean ups. The motor has 2 speeds and that is a definite plus. Love it! I love how lightweight and easy this handheld vacuum makes it to quickly vacuum pet hair off the furniture without having to get the big vacuum out. I do dislike that the hair clings to the bag on the back - but I still gave it 5 stars because I don't know how you could eliminate that problem and still have it be so lightweight and versatile. I do love it and would recommend it to others. We have newly carpeted stairs and this handheld vacuum is perfect. This little guy does the job!!! I recently purchased this item and am beyond glad I did. It does wonders on our stairs and works great on upholstery. I am considering giving this as Christmas gifts to my family. Had one of these years ago and since then tried so many others. Nothing compared for stairs. Arrived early gets the job done but is extremely loud. I got this for my mother in law, she’s not able to lift those heavier vacuums at 95. It kept her independent. Great Products for sure would buy again, perfectly what we were looking for when we purchased this item. We are glad we could find it with such a great deal, works perfectly. thank you. Perfect for the stairs and vacuuming the furniture! Pretty good loud little vacuum that scares the hell out of the cat! But it does the intended job of cleaning up litter spray. Hope it works well in the car also. "DO I NEED TO BUY BAGS?" The vacuum does use bags. It uses Dirt Devil Type G Vacuum Bags. "Do you have a household dirt devil model 08130?" need to replace older model that broke.